to view all of your assets in on place and track your goals and view your spending. Our process begins with getting to know you really well. We want to understand what makes you tick, and what is most important to you personally and financially. We will create a safe and comfortable environment for you, so you can share not only your financial goals, but also topics that you may be concerned with or scared about. We believe your personal goals and passions are equally as important as your financial ones. Once we know your concerns and objectives, we can help create a custom financial plan to help you work towards accomplishing them. 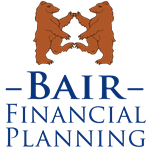 Through our refined Bair Financial Planning 5 Step process we are able to help you identify your personal and financial goals. We will help you organize and prioritize your goals, then create a game plan to help you work towards accomplishing them. We will meet regularly throughout the years, and support you as your personal and professional life changes. Goal Discussion – A personal meeting to get to know you as a person and your financial and personal goals. We will gather and review your financial documents in this step also. Strategy Session – Review your top goals to determine if you are on target towards reaching those goals, if not discuss alternate scenarios. Deliver Financial Plan – At this stage we will review your custom financial plan and set up your Personal Financial Planning website. Click Here to view our Financial Planning video. Just as you would have an array of lab tests done before meeting with your doctor for an annual physical, we also want to make sure that we are looking at you holistically and run "financial lab tests" before we make any recommendations. We are an independent Financial Planning practice and we have a Fiduciary responsibility to you and not to a company. This means we work for you and not an investment or insurance company. We are concerned about your whole financial well being not just selling a product. We will help you analyze what you own, help you figure out why you own it and how it works with your financial goals.